For paddleboarders, the state of Florida is hard to beat. With islands, keys, beaches, bays, inland waterways and lakes the whole gamut of watery environments is here to be enjoyed and explored. There are ideal locales for beginners and testing waters for intermediates and advanced. Paddleboarding is massively popular in Florida and there is no shortage of themed tours, schools, stores and rental facilities available to cater for your every need. Accommodation abounds such is the tourist and traveler pull to this state. 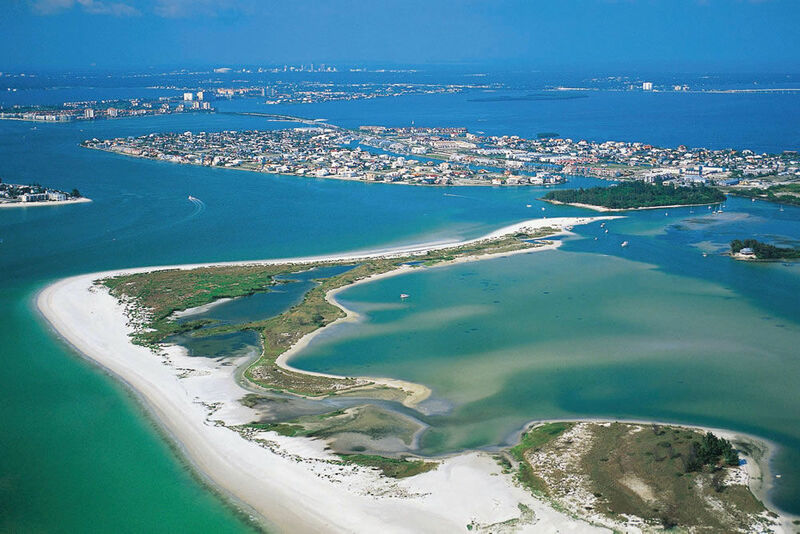 The northwest of Florida offers much in the way of Gulf paddleboarding and inland waterway travel. Along the 26 miles of coastline are the geographical marvels of the county’s coastal dune lakes. These 6,000-year-old lakes are fed by streams and groundwater springs which are complemented by sporadic connections to the Gulf of Mexico. Saltwater and marine animals cross back and forth into these lakes making them a very special environment indeed. 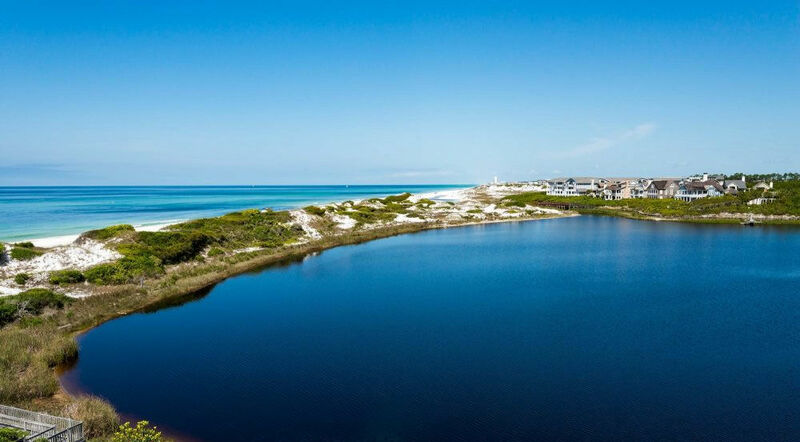 On the largest coastal dune lake, Western Lake, you will find serene surroundings for practicing SUP yoga – an outdoor experience we recommend wholeheartedly. Events such as Run SUP and Yoga SUP are held regularly from the Watercolor Inn & Resort Boathouse here. A number of agencies run 90-minute tours led by certified staff; there’s always a lot to learn from guides, whether it’s about technique or the surroundings and history. It’s one of the big attractions to us – traveling to new places and learning from the locals. There are around 15 lakes that are sizeable enough to ride on, and each has its own character and draw. As with most places in Florida the outdoors are well-subscribed to by visitors and locals so if peace and quiet is your aim then it’s worth scouting out a few places to see which suits you best. The Red Paddle Co. SUP is one of our favorites for paddleboard yoga. Its large, stable area inspires confidence and its build quality means that it will easily withstand the rigors of salt water excursions. A mere stone’s throw away from the coastal dune lakes is Miramar Beach, gorgeous sugar-white sand meeting the warm, flat waters of the Gulf. Paddleboarding here gives you the chance to see dolphins and sea turtles idle by and occasionally come to your board and give you a curious inspection! It’s an ideal coastal location for learning how to paddleboard or experience how the difference between inland paddleboarding differs from the open water in a relatively safe environment. While our team prefers to use their own SUPs, not everyone has the luxury of owning more than one board for different occasions or the ability to transport them. Also if you are just trying the sport out it’s reasonable to hire a board before spending too much money on something you might feel isn’t for you. 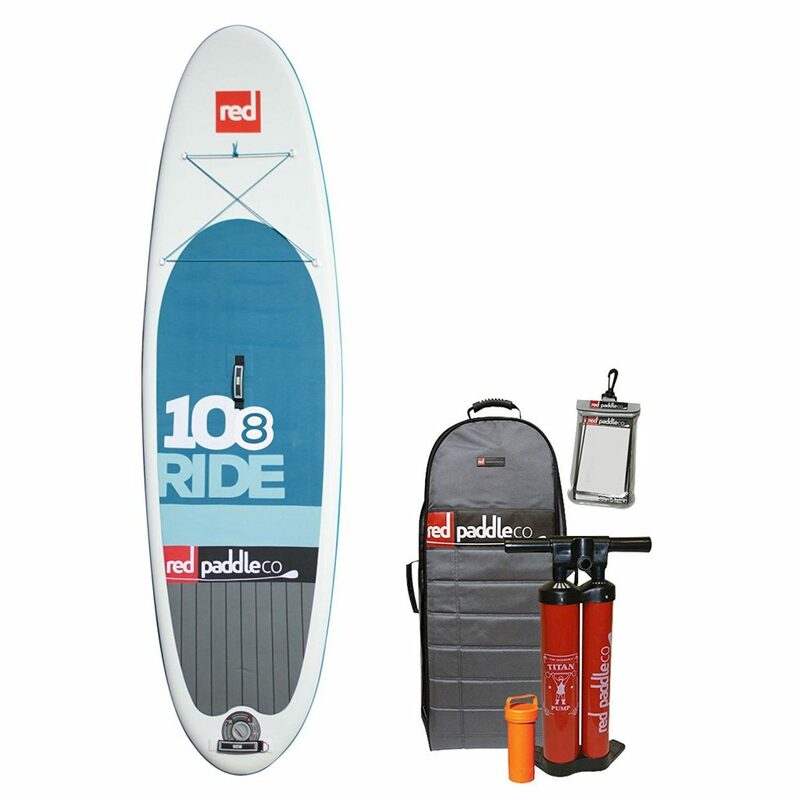 Well your requirements are easily matched by the range and number of SUP stores all competing for board and accessory rental, some also providing free delivery. The coastal community of Destin Harbor plays host to regular influxes of paddleboarding tourists. It’s a delightful town that we always find welcoming and embracing. Destin Harbor is a treasure trove of wildlife – it’s surprising to see how large pelicans are in the flesh! Paddleboarders can choose to ride on the calm Gulf waters, where many species of sea turtles abound, or go inland up the many freshwater bayous where you’ll see alligators, an experience you’ll not soon forget. A much-maligned reptile, the American alligator, is a protected species and one that doesn’t pose you any danger unless you provoke them or go near a nest. Alligators eat small animals and would rarely attack a human. It should go without saying though that we would not advise going where alligators are present if you are with children or dogs. 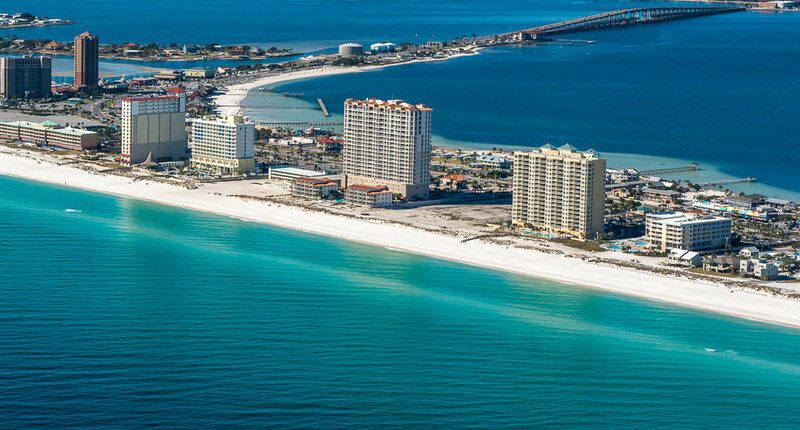 While Destin is a small town it accounts for 80% of the Gulf Coast’s annual 4.5 million visitors. It’s little wonder that our sport is so well catered for here – stores, schools and shore-side entertainments all compete for your attention when you take a break from your board. So if you are keen on trying freshwater and saltwater paddleboarding in this beautiful area of the Emerald Coast we would suggest you book accommodation for at least a couple of days to give yourself the best chance of familiarizing yourself with what Destin Harbor has to offer. The Panhandle counties’ waterways come under a state-wide network called Greenways and Trails. These protected routes are a joy for paddleboarders who will be amazed by the diversity of plant and animal life around every twist and turn. Holme’s Creek is one of the most impressive waterways as it passes from high, sandy banks through low-lying swamp on its way to the Gulf. As you paddle by you will be met by attractive green and blue heron, tuneful warblers and the unmistakable rat-a-tatting of woodpeckers. A tributary of Holme’s Creek is the beautiful cold spring: Cypress Springs, a crystal-clear stream that has visibility right down through the depths. Marvel at turtles, crawfish and colorful fish and pause to do some swimming – snorkeling is a great way to get up close and personal with the natural world here. One caveat with creek paddling is that there are hazards above and below the surface – from low-lying branches causing you to duck your head, to under water tree trunks that can snag your board. Just keep your wits about you and you’ll be fine. 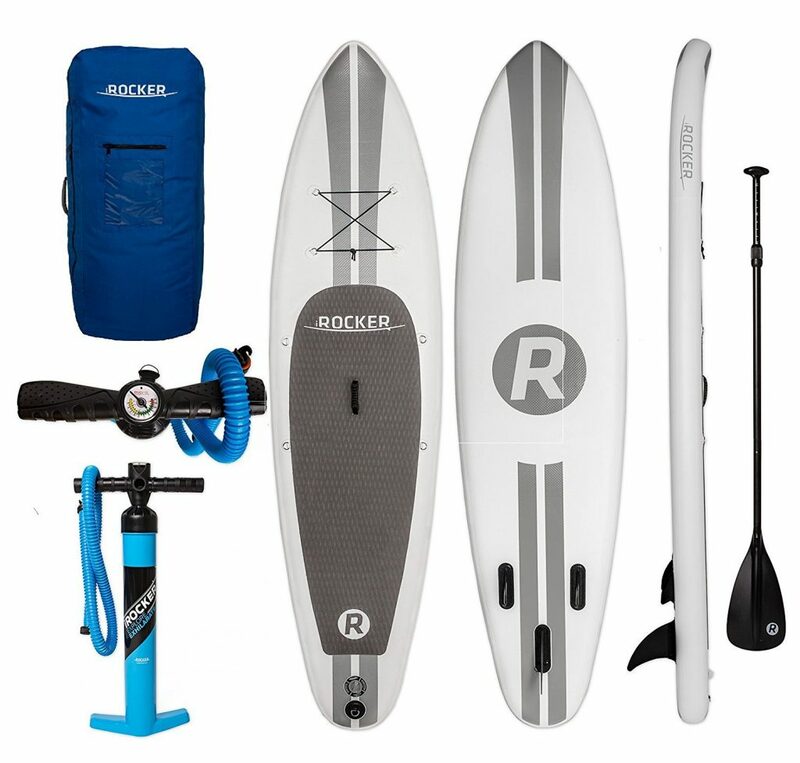 The 11-foot-long iRocker SUP is a well-balanced and confident performer in faster moving waters. At home on rivers this paddleboard is a reliable and robust option that won’t let you down on your more ambitious trips. This stylish board suits most tastes and it ranks as one of our all-time favorites. This board has an impressive load capacity that makes it stand out from the crowd – ideal for stowing plenty of touring supplies and accessories. The six-inch height of the board helps give it its high buoyancy and also means you can ride without getting your feet wet! Mixing history and nature is the thin strip of sugar-white sand that is Pensacola Beach. This area has been subject to preservation legislation making this a living museum. The sidewalks have a plentiful array of stores and draws while the beach itself is blessed with many amenities to keep you occupied and equipped with supplies for your travels. After you’ve enjoyed the waters you can sample some of the local cuisine from one of the many good quality eateries in the area. Pensacola Beach is suitable for families with young children especially if you’re after a relaxing break. The atmosphere is very laid back; the boardwalk has attractions and amusements that stretch all the way to the Santa Rosa Sound. This north shore is a model for serenity and an ideal launching place for beginners to get their open-water paddling legs. There probably isn’t a single soul who hasn’t heard of Tampa Bay. This is Florida’s largest open-water estuary, some 400 square miles in size fed from over a hundred tributaries including the Hillsborough River, the Alafia, Manatee and Little Manatee all pouring millions of gallons of fresh water into the bay each year. 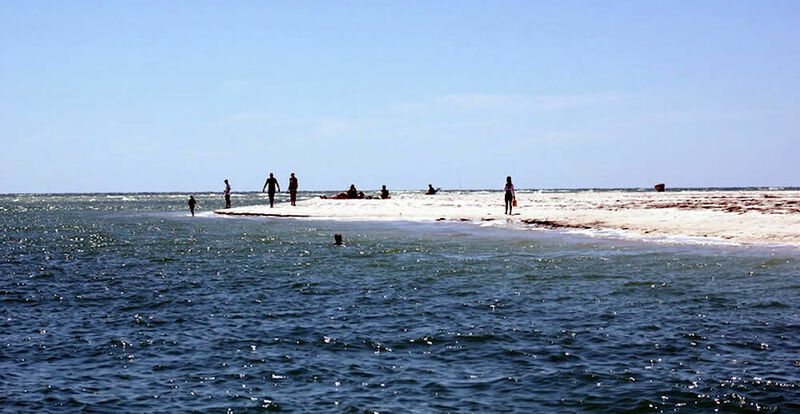 One of the best features of Tampa Bay is its expanse of shallow water – on average only 12 feet deep, ideal of jumping in, swimming and not so deep that you can’t see the bottom. And being able to see through these waters opens up a world of bottlenose dolphins, manatees (of course! ), oysters and shrimp. Don’t forget your waterproof camera. Laughing gulls wheel overhead and pink-winged roseate spoonbills feed in the shallows. This is a nature-lover’s paradise, 200 species of fish and birds occupy mangroves, islands and coastline. The bay has plentiful SUP stores, schools and touring companies. It’s a very tourist-oriented part of the West Coast so expect crowds and consumerism to temper the atmosphere of this natural gem. PEAK inflatable SUPs are great for saltwater riding – their skins are resilient and seem to us to have the edge when it comes to UV resistance. This 10′ 6″ board is very stable and a solid performer with excellent buoyancy. We readily recommend this board for Gulf or ocean use. One of the best features of the waters off Engelwood Beach, Sarasota and northwards is how clear they are. This is all down to the high water exchange between the Gulf of Mexico and Sarasota Bay. If you head towards the Ted Sperling Nature Park, Lido Key, you will be delighted by one of regulations. For paddleboarders and, indeed kayakers and swimmers, there are no boats allowed in the area! Yes, the occasional bane of our lives, the hazard posed by boats is non-existent here. The park is a crowded venue which is not surprising considering its status and that it is a ‘must-see’ place managed as it is by the Sarasota County Parks and Recreation board. There are some very good schools in the vicinity which offer classes from beginner to advanced, providing education about the sport and the environment. It’s not just paddleboarding – there are classes for kayakers too, along with tours. You can even book a private tour where you and your group will be treated to a bespoke voyage around the keys and rivers. Facilities and amenities are good and there is the option of hiring boards and equipment for you time here. Children are welcome and encouraged and there is a good family atmosphere. Organizations like SUP Engelwood to the south are ASI Accredited meaning they comply with the highest international standards. 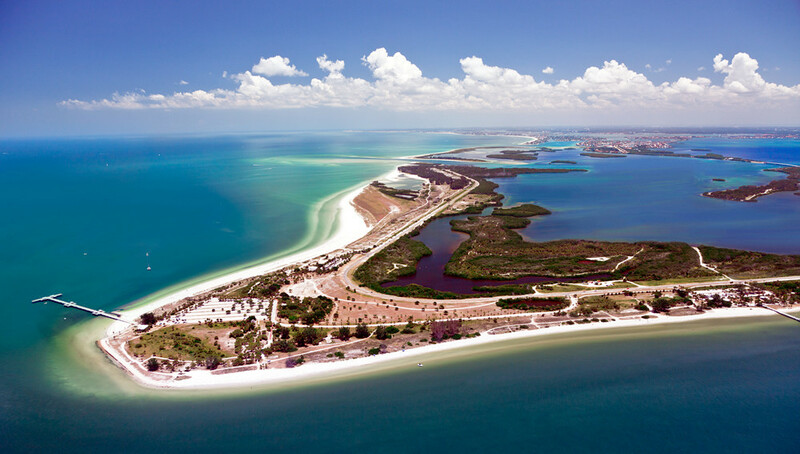 Travelling south along the coast of Sarasota County is Venice. Paddleboarding is like a way of life here – the flat waters stirred only by gentle, steady easterly winds make this a draw for beginners. Board rentals are made easy; there are many paddleboard outfits just off the beach. For us the attraction is a coral reef about a fourth of a mile from the coast. Here you can go into the water and go snorkeling for shark teeth! This is the shark tooth capital of the world and we find any chance to get hold of our very own shark teeth very exciting. If you’re keen on seeing manatees and dolphins then head over to Caspersen Beach, in the same neighborhood. The Gulf is home to over fifteen species of dolphins and manatees. 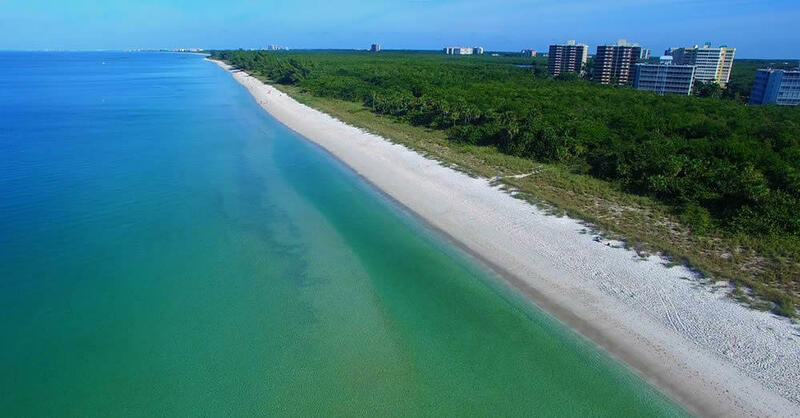 A short hop to the Caspersen Beach Nature Park has a change of environment – the brackish water attracts alligators and the water here is flat, protected from tides and waves by the preponderance of mangroves. Variety, as they say, is the spice of life. Venice offers us another treat. If you are one of the 44% of Americans who own a dog then take them to South Brohard Beach and Paw Park where riding your board with your pooch is encouraged! The west coast is a myriad of beaches, keys, islands and bays. The North Jetty at Casey Key has public beach and bay access and presents itself as distinct areas for paddling depending on your skill level. If you’re starting out then bayside is best and move on to the barrier islands nearby. More expert paddleboarders can go past the jetty and into the Gulf itself and do some paddle surfing up towards Venice Beach itself. Outside of paddleboarding, Venice has some fabulous picnic areas, scenic paths and recreation areas – you can easily make a great vacation here. To the southwest of Florida lie the beautiful white sands of the Naples beaches. 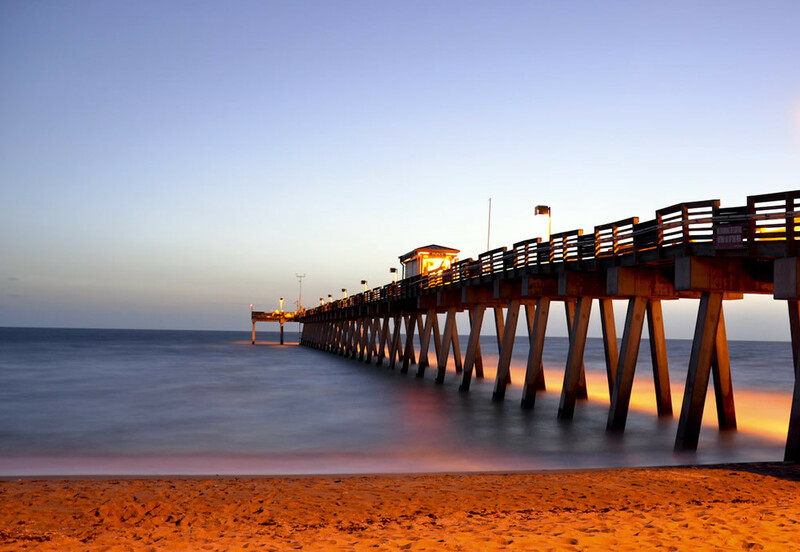 Stunning stretches like Vanderbilt Beach, North Gulfshore Boulevard Beach, Lowdermilk Beach Park endow Naples with some of the best beaches in the state. Our preference – and it’s a close-run thing – is Delnor-Wiggins Pass State Park. This park is on a barrier island just off the coast and lies on the mouth of the Cocohatchee River. Paddleboarding here is to experience sights of bald eagles, ospreys and loggerhead sea turtles. The park is also home to the endangered gopher tortoise, the only species of tortoise to be found east of the Mississippi. Naples is an unashamedly touristy city, stylish and welcoming. Well-preserved and protected waterways have constantly changing vistas as foliage and fauna give way to ever more diverse species. 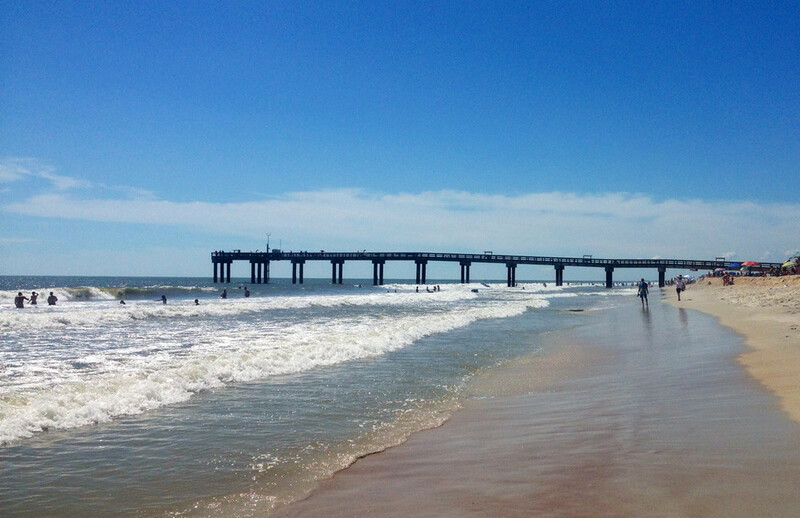 Celebrated globally for its NASCAR racing, Daytona Beach bears the nickname of ‘The World’s Most Famous Beach’. But for paddleboarders it is the dolphin and manatee sightseeing tours that capture our hearts. SUP schools are easy to find here and there is a preponderance of rental stores that you can hire a board from and, of course, all the accessories you could ever need! In the Daytona Beach area paddleboarding has really taken off and it attracts all manner of riders. Some come to catch a bit of surf and travel fast, others go for fishing and touring and others arrive for yoga (and to be honest, we come here to do a bit of everything). The waterways here are breathtaking whether it’s the access to the Atlantic Ocean or the backwaters of the estuaries. 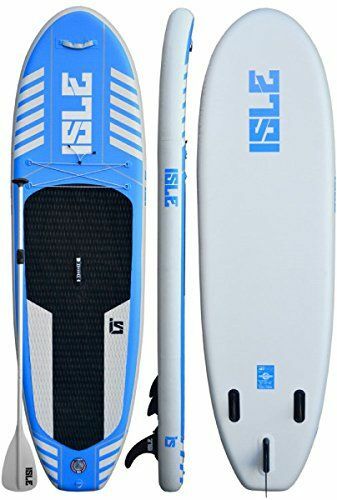 The ISLE All Around SUP is a clear winner for us when it comes to choosing a board that will perform well in multiple scenarios. The ‘all around’ shape of the SUP maximises stability for forwards travel and resilience against waves. The slight rocker on the front improves on this further and allows you to cut through choppy waters with greater ease than most of its rivals. One thing you will always find when paddleboarding in Florida in areas such as these is the need to carry your board between locations – the ISLE is one of the lightest boards you will find and its innovative internal design means you are not sacrificing structural strength. South of Daytona lies New Smyrna Beach. 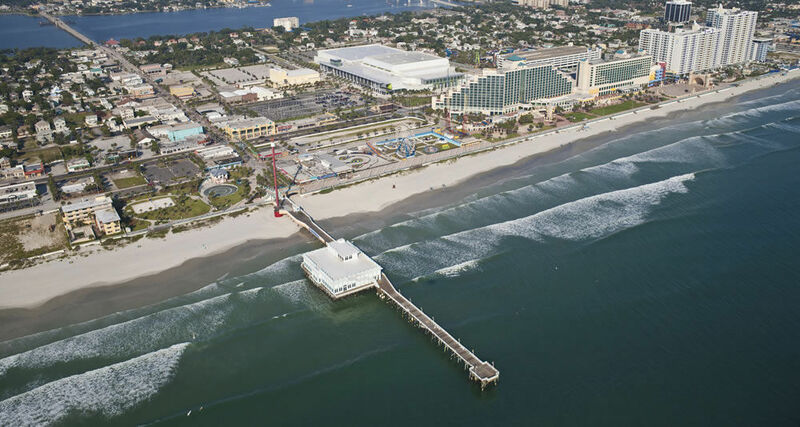 This city in Volusia County is the hub of a small coastal community in the confluence of multiple rivers surrounded by bays and the Atlantic Ocean. There are so many different environments here to take your paddleboard out on to that it can be quite a tricky decision to see where you go first! There are many tour operators and guides so you will never be left on your own if you want to learn more about this exciting city or what to expect to see on the water. For beginners there are the calm secluded bays but if you want more of a challenge you can head further inland and practice on the rivers or take your board out onto the ocean itself. It’s truly a place that caters to people of all abilities and experience. One of the most jaw-dropping sights you will see are the spectacular sunsets over the Atlantic – definitely take your waterproof camera to catch some of these moments. But in this world of reaching for your camera, don’t forget to take the time to actually experience the event itself! 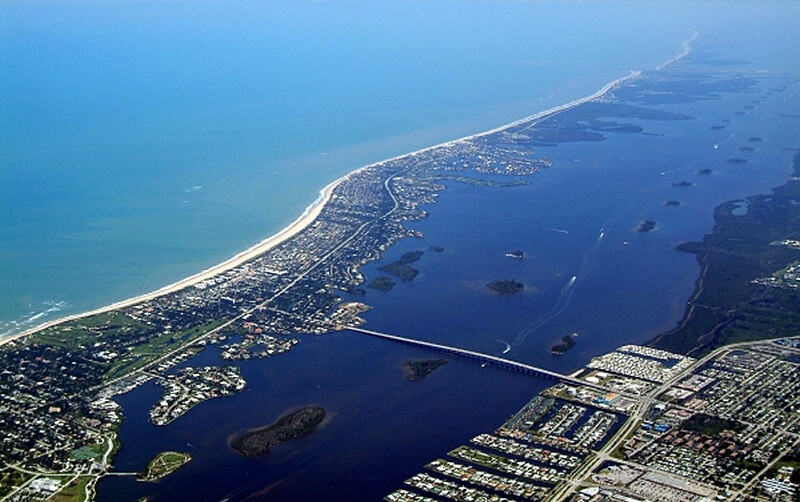 Downtown New Smyrna Beach is on the Indian River’s west side and is situated on the impressive river’s lagoon system. The Ponce de Leon inlet is where you can gain access to the ocean but also take the time to visit the famous lighthouse museum here. 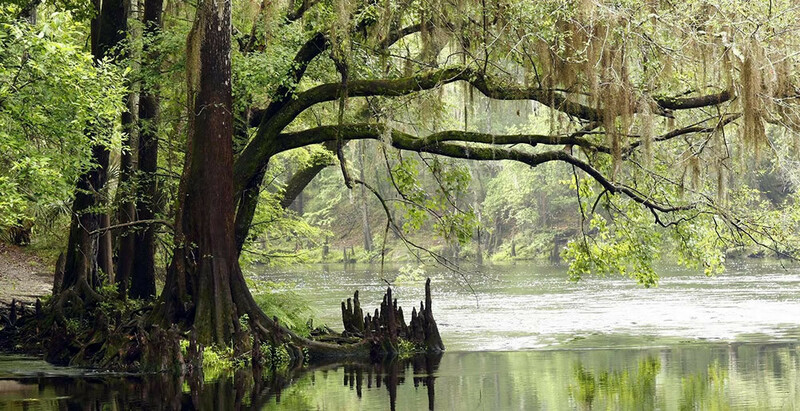 Inland you will arrive at Spruce Creek – a natural, blackwater stream wending its way through the Spruce Creek Basin. This rare environment has dark-hued water caused by tannins leaching into it from the thick submerged flora. River paddleboarding through this ancient cypress swamp takes you through increasingly broader waters that slowly give way from freshwater hardwood swamp to grassy freshwater marsh then saltwater marsh then mangrove swamp. The creek is designated as a State Canoe trail and is given a Class III water quality rating owing to its natural condition. Further south we find Vero Beach, a city specializing in providing visitors the best paddleboarding experience. There are rental stores, certified PaddleFit instructors, guided touring, custom board sellers and floating docks for you to try out a board before you buy. Much of the paddleboarding you can do here is as part of groups and organized excursions. Trips up the Indian River and around the mangrove islands open up a world of dolphins, manatees, stingray, snook and and tarpon. The two-hour tours are reasonably priced at around $60 inclusive of tax. 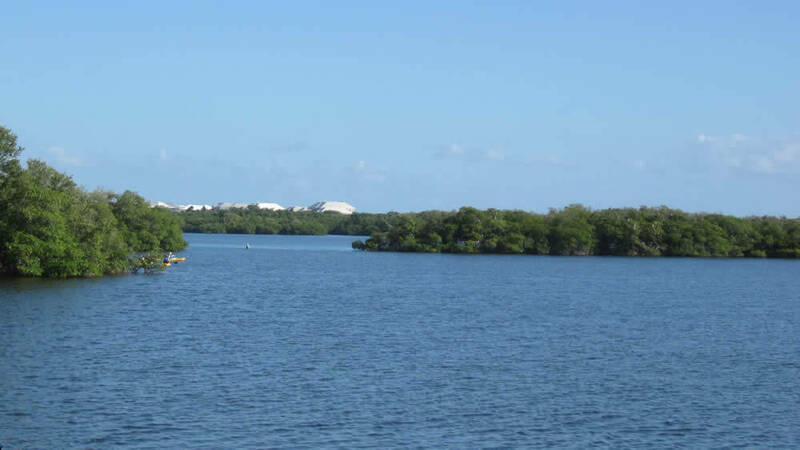 At 20 miles long and a mile wide, Lake Worth Lagoon runs parallel to and is connected to the Atlantic Ocean via two inlets – the Lake Worth Inlet and the South Lake Worth Inlet. Its barrier beaches are connected by eight causeways and bridges. In the north is the wide Intracoastal Waterway that stretches from Jupiter to the south’s Boynton Beach. Formerly a freshwater lake, Lake Worth was opened up to the Atlantic to allow canal-style travel up the waterway. This caused the lake’s environment to morph into the saline lagoon we have today. There are many mangrove islands like Munyon and Snook which you can paddle around and explore. 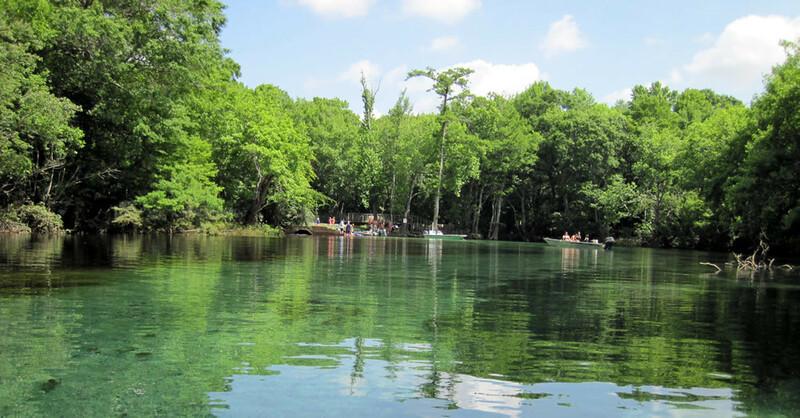 Then there are the lakes, Ida, Okeeheelee and Osborne for inland excursions and yoga practice. On the coast of the county you can take part in racing paddleboarding or catch some surf for a bit of downwinding – where the breeze allows for regular swells that help propel you onwards. 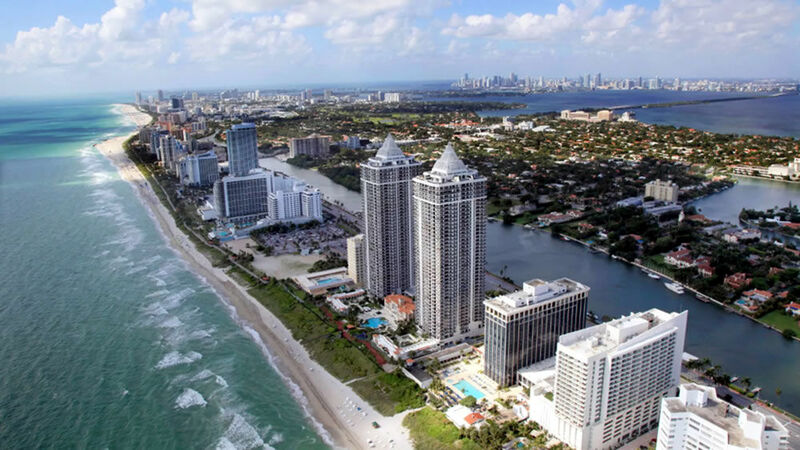 A perennially popular paddleboarding hotspot, Miami Beach is an amazing city with an equally amazing coastline. This tourist-oriented locale enjoys many companies offering trips across places famous as Biscayne Bay and Virginia Key. You might expect that because of its popularity that Miami Beach may be over-crowded with visitors. It is true to say that it very well subscribed but schools that offer the SUP Workout put serenity ahead of the excited activity of the masses. Training provides you with stability, strength and coordination and acts as a stress-relieving process that also builds your level of balance and ability. Miami is an ideal location for paddleboarders who want the proximity of the urban environment with all the trappings that go with it. Sightseeing here includes manmade marvels such as million-dollar manses and Vizcaya Museum and Gardens – the historic 1920s mansion home of industrialist James Deering (of Deering Harvester Company fame). Being Miami you expect spectacular and something out of the ordinary. Miami doesn’t disappoint: here you can go paddleboarding safely by night by where LED and neon-lit tours make this a 24-hour paddleboarding capital! Off Florida’s southwest coast is the majestic string of mangrove islets situated between Cape Romano and the mouth of Lostman’s River. Officially there are just over a couple of hundred islands and they range from elevated points of a submergent coastline to spits and mangroves that established themselves on oyster sand bars. Some of these islands are little more than a basketball court in size awhile others are large enough to stage a football match. The Ten Thousand Islands are perfect for an idyllic, solitary trip – no crowds here – so you can really unwind, perhaps do some yoga. Ospreys hunt in the skies looking for their next meal from the abundant fish menu such as crappie, scatfish and shad. As part of the Ten Thousand Islands National Wildlife Refuge the Everglades fall within the most southerly part of the island group and their unique ecosystem warrant their separate inclusion as a paddleboarding nirvana. Everglades National Park is the go-to place for camping; make sure you get a permit organized in good time from Everglades City. In the winter the Everglades National Park becomes an even more popular getaway and all of the 48 designated campsites. If you want to use one of these islands as your base for your paddleboarding excursion you need to be more self-sufficient than at most vacationing destinations. You will need food, water, bug-repellant, first-aid kit and it’s advisable to be part of a group as you will be pretty much on your own here. As in horror films – cell phones just don’t work out here. Make sure your food and water supplies are securely locked away too – animals like the raccoon eagerly break into less well-protected stashes. 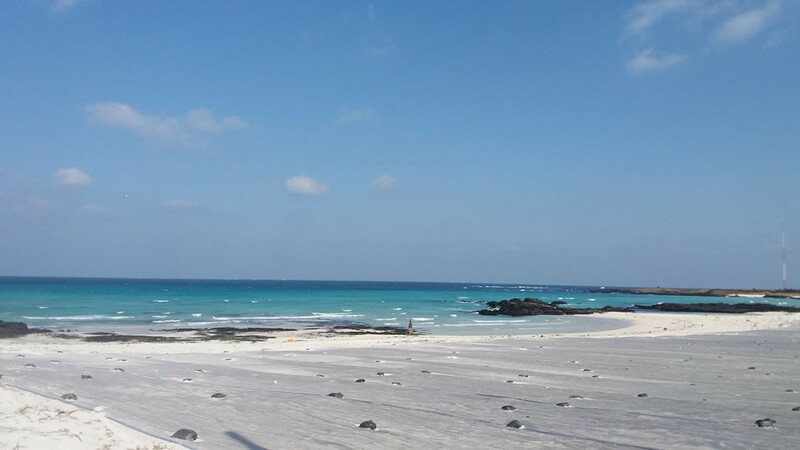 From our experience the beaches on the windward side of the islands provide best beaches and fewest pests so pitch your screened tent here if you get the chance. 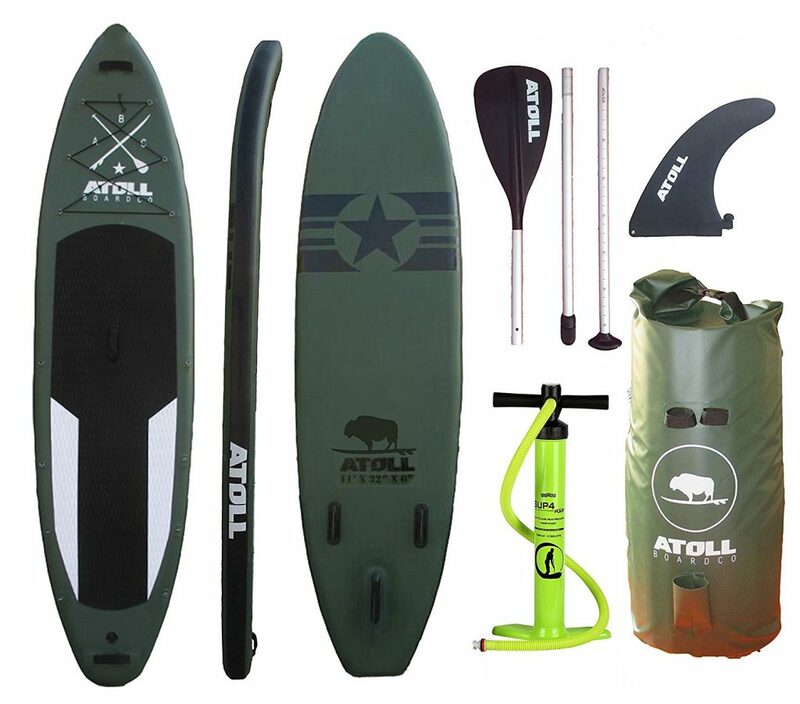 The 11-foot-long Atoll SUP is one of the most maneuverable boards on the market today! It comes with an extremely comfortable backpack that spreads its load equally across your shoulders and back. The Atoll has a generous number of D-rings allowing you to attach equipment, supplies and also for you to affix a kayak seat. 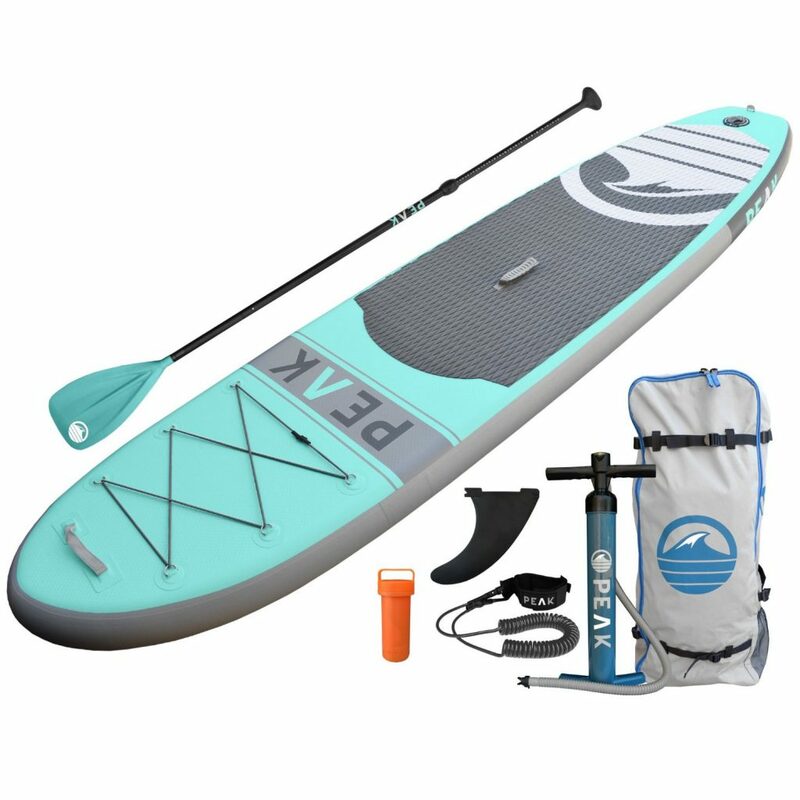 The package is versatile, well-thought-out and aimed at someone who takes their paddleboarding seriously. This is the oldest city in the States – it’s attractive and charismatic – with calm waters and little breeze lending itself to some great offshore paddleboarding. Riding the Atlantic here is by turns exciting and breath-taking as you are greeted by sights of marine life and historic buildings. The St. Augustine experience is more laidback than some of its more full-on high-energy rivals and makes for a perfect serene vacation or day trip. An article discussing the best places to paddleboard in Florida wouldn’t be complete without a mention of the Florida Keys. These warrant their own discussion but we’ll touch on two or three here to pique your interest. Out of the 1700 islands that comprise the Florida Keys archipelago, Islamorada is a ‘village’ of six islands close to the most southerly point of the Florida mainland. Attractions for paddleboarders include Snake Creek, a rocky shoreline that gives way to beautiful waters and sights of sharks, trunk fish and rays. A tunnel from Snake Creek takes you to Windley Key with shallow waters ideal for paddleboarding. 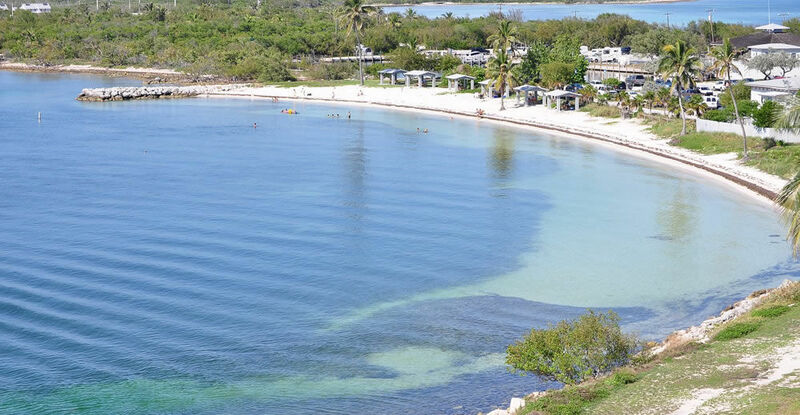 At Windley Harbor the mangrove bay offers shelter and acts as a great launching point to paddle out to deeper waters. Travelling by road further through the archipelago takes you to Bahia Honda State Park, another gorgeous location with barely untouched waterways that delight us with rarely seen wading and shoreline birds. The atmosphere is peaceful and it’s a little paradise for paddleboarders who can practice their sport in the open water without the risk of strong tides putting you at risk. And as the sun sets you may even witness a green flash as the sun slowly sets beyond the still waters.